A young student’s experience of combat and subsequent questioning of the principles by which he lives. Sabato’s intensely detailed, involving US debut, winner of two major Israeli literary prizes, concerns manifestly autobiographical protagonist and narrator Haim. 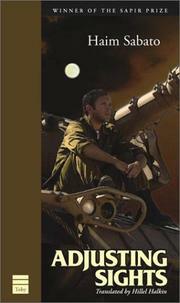 Haim is drafted out of yeshiva school to serve in the 1973 Yom Kippur War, alongside his best friend Dov (who soon thereafter disappears), then discovers he must “readjust,” both as a tank gunner “sighting” his target and as a faithful Jew whose sane, ordered world has suffered chaotic dislocation. Excessive quotations from the Torah and Talmud blunt some of the story’s impact, but Sabato’s descriptions of battlefield experiences are suitably crisp and horrific, and his knowing portrayal of Haim’s vacillations among terror, grief, doubt, and devotion seem both psychologically astute and movingly expressive of the mysterious sustaining power of deeply held faith.